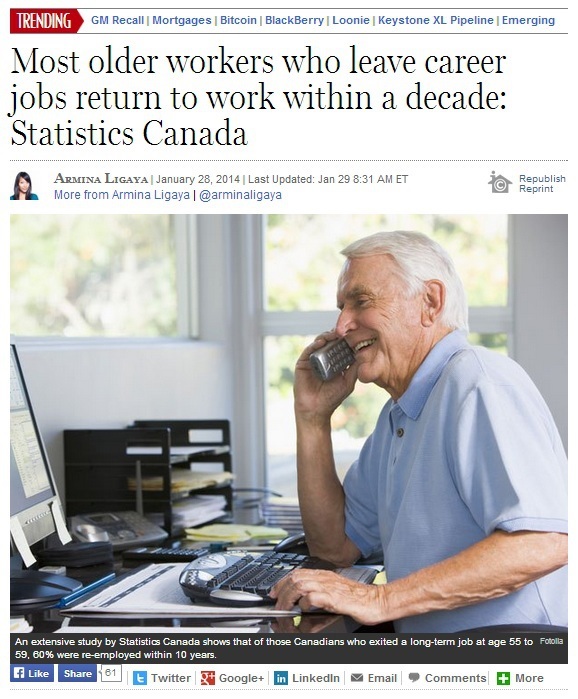 “While it would seem that older Canadians leave their long-term jobs to relax in their golden years, new analysis from Statistics Canada shows retirement is changing, and more than half of these workers aged 55 and older return to the workforce within a decade. In Canada, the number of people who are past the retirement age but continue to work full-time is rising, with most citing the need to make ends meet as the primary reason for their decision. In this day and age, it can be difficult to spend one’s retirement years without something to fall back on. This makes it all the more important to acquire life insurance as early as possible. Life insurance can be an extremely useful source of funds for retirees who continue to work for financial reasons. If retirement is 10 or 20 years away, you may want to strongly consider acquiring life insurance in Toronto and throughout Ontario that has a cash value component that you will be able to borrow or draw on in your retirement. The good news is that the payments need not be that expensive as long as you work with a trusted insurance broker who will help you work within your budget and acquire a policy that addresses your specific needs. Choosing the right life insurance policy among the hundreds of offerings can get rather confusing, especially with all the options available. Save some time and money by using a trusted, experienced Toronto life insurance broker, such as Insurance Advantage, who can explain the terms and options and help you understand them fully. Since seasoned insurance brokers work with the industry’s leading insurance carriers, they can provide you the most competitive life insurance quotes in the market for your individual situation.